EARLY R*1 WLF LETTERED "RESCUE SQUAD 1"
Re: EARLY R*1 WLF LETTERED "RESCUE SQUAD 1"
The rig's body was built by "the shops" I think, or, mmm was that Rescue 5's rig that they built? The "moving van" as it was known. This 1939 Ward LaFrance was was in an MVA in 1946 and was out of service for a while. It was returned to service minus its rear wheel skirts and was operating as Rescue 4 when it was wrecked in a fatal collision on July 31, 1954 with L136 near Junction Blvd. 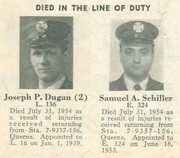 & Roosevelt Ave. FF-Dugan of L136 and FF-Schiller of E324 who was detailed to L136 were killed and 8 eight others were injured while returning from signal 7-9357-136. A man was arrested and convicted for turning in a false alarm that caused the deaths of two firefighters. 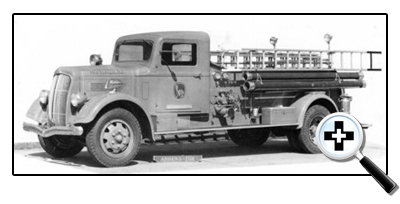 Rescue 5's first rig was a 1941 Ward LaFrance hose wagon (#290) that had been previously assigned to E251 then E203. Am I correct in presuming it was at 252 when they were a Brooklyn unit? I don't think 251 went to Queens until 1952 or '53. Can anyone describe the engine to the left in the picture? Company? Make and year? Wouldn't swear to it, Kevin, but it looks to me like one of the World's Fair light engines, 1939 Ahrens Fox model SC. I believe that at least one of those 3 was later assigned to Staten Island. Tom Eve can probably confirm that. If I'm right, here's a better photo . . . There were three 1938 Ahrens-Fox 500gpm pumpers (shop #'s 9043, 9044 & 9045).Engine 163 was 1st due to that box and they had one, #9043 as a 2nd pc. hose wagon. It was originally assigned to World's Fair Eng. 332 then went to E151 as a 2nd pc. wagon before going to E163. The other two 500gpm Ahrens-Fox were #9044 that was originally assigned to World's Fair E332, E324 and finally E52's 2nd pc. wagon. #9045 was originally at World's Fair E333, then World's Fair E331-2 then was assigned as the Airport Crash Unit, then as E316's 2nd pc. wagon, then finally went to Staten Island to serve as E156's 2nd pc. wagon. G MAN Thank You for your continuing wealth of information that you provide on FDNY History.